Congratulations to the 2018 Contender winner, CCA Life Member Earl Williams! Thank you to Contender for the generous donation and for stepping up again with a new for 2019 Contender 28 Tournament! 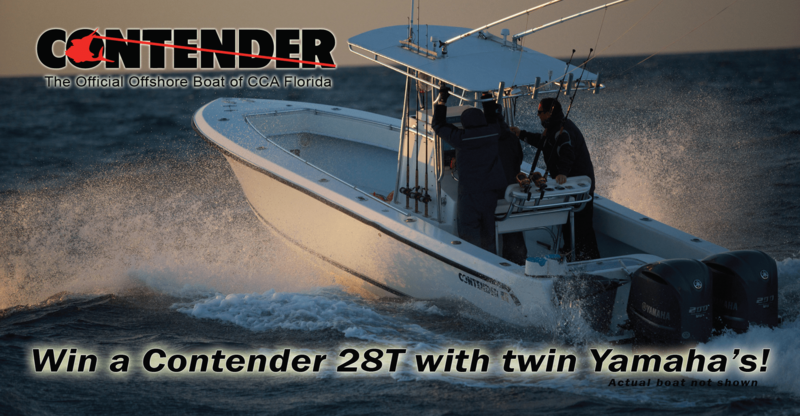 Contender, the Official Offshore Boat of CCA Florida, has donated a 2019 Contender 28’ Tournament Edition Center Console, complete with twin Yamaha motors and aluminum AmeraTrail trailer. **Winner will receive a Contender 28 Tournament complete with twin Yamaha motors and a custom aluminum trailer. Drawing to be held on October 17, 2019 between 7:00 and 10:00 PM at the Coral Gables Country Club 997 N Greenway Dr, Miami, FL 33134. Winner need not be present to win. Winner is responsible for all applicable taxes. Limit of 10 tickets per person. Prize donated by Contender Boats Inc. Prize is offered in “as is” condition. No purchase or contribution is necessary to participate. Tickets are $100 each (suggested minimum donation). The drawing is being conducted by Coastal Conservation Association Florida whose principle place of business is 4061 Forrestal Avenue, Suite 8, Orlando, Florida 32806.